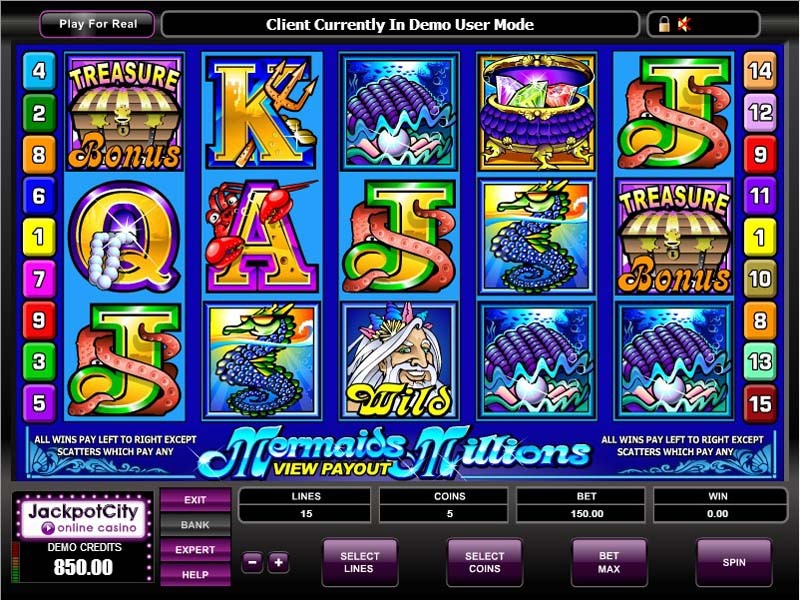 Players who are looking to enjoy a gambling experience that will take them on an adventure into the depths of the oceans and the seas will certainly enjoy this game, Mermaid Millions. Players can expect top notch quality graphics because the game is powered by none other than Microgaming, the leading name in the industry of software development. The symbols are all inspired by that theme as they include a mermaid, a fish, a treasure chest, a sea horse and poker card symbols that are surrounded with marine creatures to fit the theme of the game. These symbols appear on 5 reels and 15 paylines. The game has a wild symbol, Poseidon. This symbol has the power to replace any other symbol that appears on the reels of the slot machine with the exception of bonus and the scatter symbols. The bonus symbol is the treasure chest symbol and it can trigger the bonus round. The Mermaid is the scatter symbol that gives players scattered rewards as well as activating the free spins round that can be quite lucrative for players.